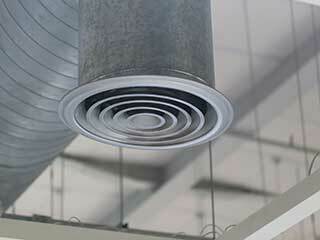 Have the air ducts at your business professionally and thoroughly cleaned today! Why Have It Cleaned At All? While your air duct works all year long to deliver heating, AC, and ventilation to your business, it’s also doing something else: sucking in dust. Dirt and allergens are drawn in, and build up over time. These clogs can cause mold and bacteria to grow. If not cleared out regularly, these particles contaminate the air distributed all over for you and your fellow workers to breathe in. What does this mean for you? One issue is that of energy consumption. Thanks to the blockages in your duct, it takes far more energy than usual to force the air through it. This causes your bill to rise substantially, and will certainly cost you over time. Considering the price of energy is already growing as of late, that’s the last thing you want! Another problem is the effect on your coworkers. Even with the healthiest individual, contaminated air can slow them down due to fatigue. Allergy sufferers will be plagued with itchy eyes and noses, as well as blurred vision, all of which is incredibly distracting. People with breathing troubles in general, such as the elderly and those with asthma, will have an even worse time. These factors lead to one thing: a drastic decline in work output. Our professionals can come to your business equipped with the best possible tools to get to work on your. It’s important with this process to know that you have experts who know what they’re doing. Otherwise, the loosened dirt will just wind up entering your workplace even more, making the whole job a bust. We have years of knowledge from working around the area with businesses just like yours, so you won’t have to worry! This familiarity also means we’ll work fast, without losing quality. We know that you don’t want distractions at the workplace either, so we’ll get in and out as quickly as possible. It’s far better to be safe than sorry, so contact Air Duct Cleaning Escondido today to ensure that you and your coworkers can breathe easily.